Combine the corn starch, baking soda and water in a medium sauce pan. Turn on heat to medium. Stir ingredients until the mixture starts to thicken, about 2-3 minutes, then remove from heat. The mixture should look like mashed potatoes when it is the right consistency. Let the dough cool for several minutes until it is just warm to the touch. Preheat the oven to 175° F.
Remove the dough onto a cutting board or non-stick surface dusted with corn starch. Immediately add soap and water to your saucepan for easier clean up. Knead the dough so that it forms a ball. Roll dough to be 1/4-inch thick. Add more corn starch if you feel the dough is too sticky. Avoid over-handling the dough, this may cause more cracks when the dough dries. Cut out shapes and decorate the ornaments as desired. Use a straw to create a hole large enough for your string or ribbon to fit through. After you’ve cut shapes, you may reform the dough and cut again, but the second batch of shapes may develop more flaking or cracks. Arrange the shapes on a parchment lined baking sheet. The key to getting perfect ornaments (ones without flakes or cracks) is to dry the ornaments very slowly. Bake them at a low heat,175° F., for 45-60 minutes. Turn the ornaments over half way. The ornaments are done when they are completely white and your nail can’t make a dent in the dough. Depending on how thick your ornaments are, this can take longer than an hour. At such a low heat, you won’t brown the ornaments unless they are over-baked for a very long time. Let the ornaments cool completely before decorating and adding string to hang them. This only takes a few minutes if you move the ornaments from the baking sheet to a cooling rack. There are so many different ways to decorate corn starch ornaments! 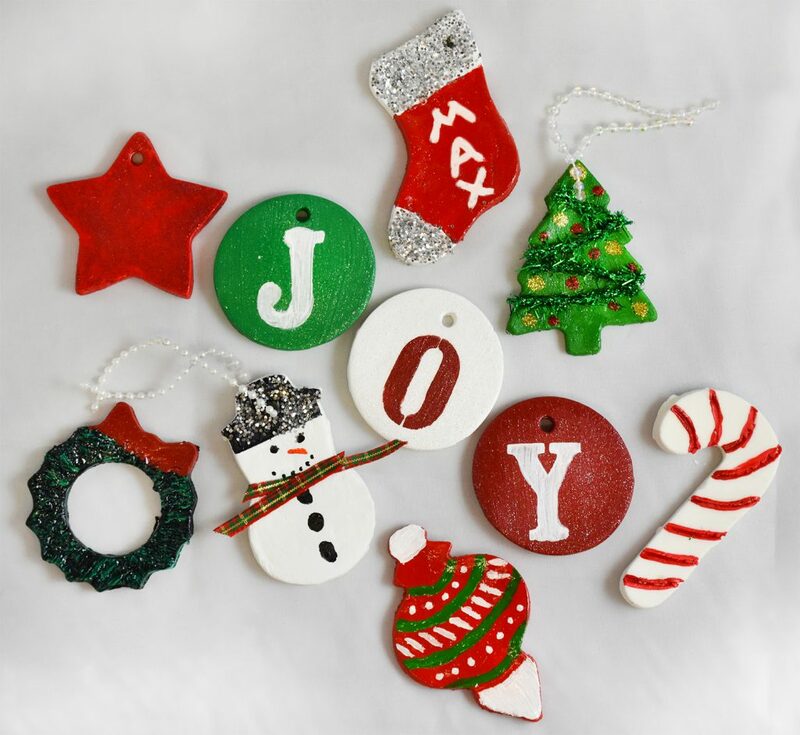 One of the easiest ways to transform plain white ornaments is to paint them with acrylics. This quick drying paint allows you to get a coat on all sides of the ornaments at once. For the ornaments below, we used stencils for the letters, glitter glue sticks and ribbon to decorate. It’s a good idea to seal your artwork with a clear aerosol such as modge podge. Hand print ornaments commemorate a child’s growth. There are two different ways to do a print-a direct print or the reverse. The photo below shows a reversed hand print. To achieve this look, we took a print in the corn starch dough and baked it. We then used it as a mold for another piece of dough. The result is a 3D handprint that stands out from the background.